after the city’s legendary calamity. But we end up caring about the past, wishing to return to it, only to find, unlike those who went before us, that a growing portion of our past is there, detailed in a form, photography, that we acknowledge as a factual record. When I wrote about picturing myself among the airmen and mechanics, it was a creative, fanciful thought, as if such an experience was inaccessible except to imagination. 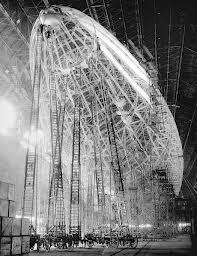 Since then, partly through my search for that photo that first gave rise to this poem, I’ve found that we have easy access to a tremendous record of images of Zeppelins under construction, often eerily beautiful images. The images in the slideshow below are taken from an amazing page on the USS Akron at the French site La boite verte. 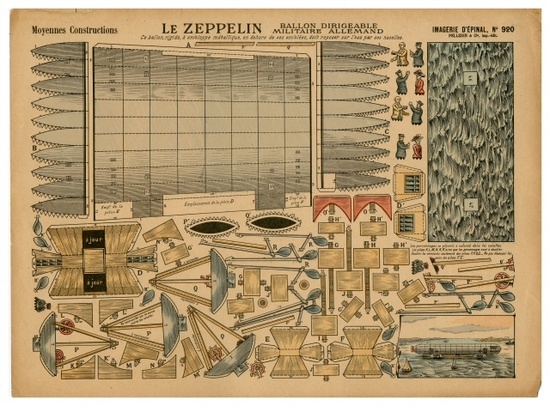 Of course, there’s more than one way to make a Zeppelin. Wow, what a find! Thanks for sharing! Any idea how long it took to build the USS Akron? Last question, didn’t the USS Akron crash?